ItemL.11966 - Julius Balshine, Rabbi Philip Bregman, [Jean] Vered, and David [Ofer]. 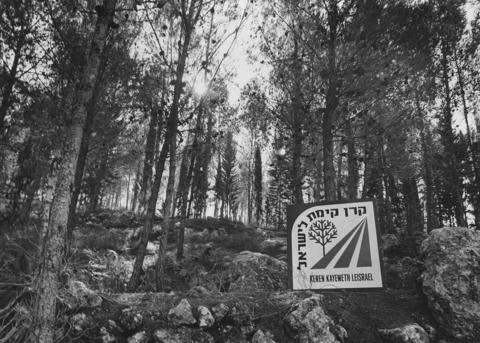 1 photograph : b&w print ; 5" x 7"
Photograph depicts a sign in a forest which reads "Keren Kayemeth Leisrael". Noted in JWB database: "(sign in forest: 'Keren Kayemeth Leisrael')". Written on the verso: "82/1/5/797 - The Jewish National Fund at 80. WZPS photo by Shuki Kook. Jan14 1982. Crop to fill. 2 x 3 3/4 P.3 85%. Jan. 20/83. Feb. 4/82 P. 7."